The Free Tornado Funnel Diagram for PowerPoint is a 3D template to enhance the business presentations. 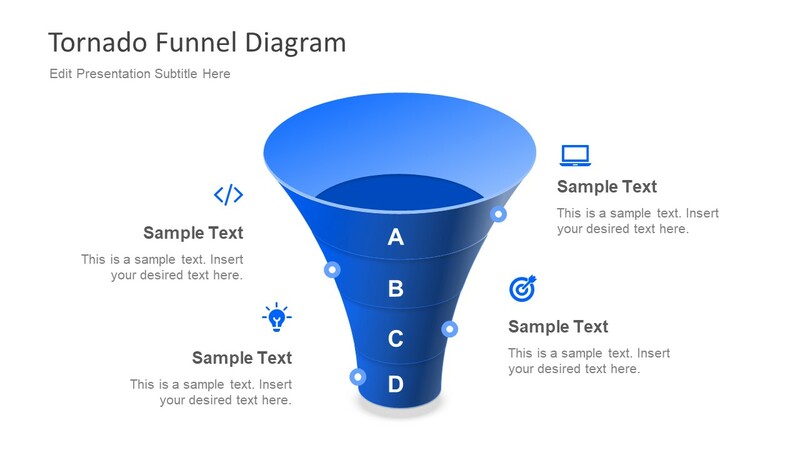 It is an innovative sales funnel template with beautiful shape of 4 level diagram. Each level has clipart icons and alphabetic letters to represent them. Also, the text placeholders alongside the icons enable users to add useful information. Hence, the viewers can relate the text to its graphic representation and understand the message. Because it is a free Presentation diagram of editable elements. The tornado shaped diagram has the option to create more layers, simply by pasting additional segments and adjust them. Although it is a traditional design to present the data filtering process of a business activity. The template can also demonstrate the phases of project development or a process. The Free Tornado Funnel Diagram for PowerPoint is an impressive template to describe the sequences. However, the funnel diagram is ideal to display topics like, selection criteria through multiple stages. Most importantly, the professionals in the field of sales and marketing can largely benefit from funnel shapes in diagram slides. For example, to explain the marketing strategy and target audience. Or, graphically illustrating a lead generation process which is easy and quick to comprehend. The sales and marketing professionals have unlimited streams of product and services to sell. 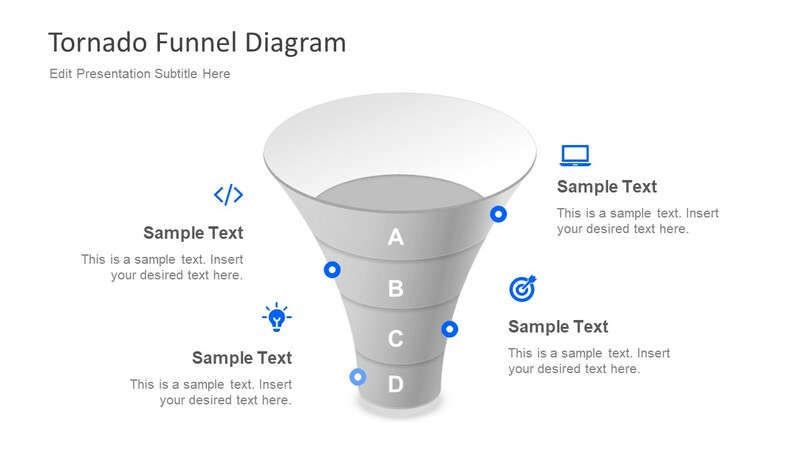 The funnel graphics for PowerPoint diagram can aid as a time-saving guide for latest products. 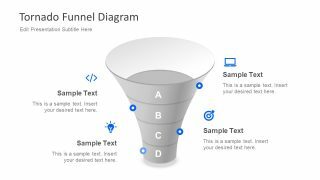 The editable PowerPoint funnel template shows a top view of a 3D diagram in the shape of a tornado. The users can edit the text placeholders, make alterations in the font. Similarly, format the background and diagram’s colors. This is a free PowerPoint of 2 slides. But, for more layout variations, check out the SlideModel’s 4 Step tornado funnel diagram. 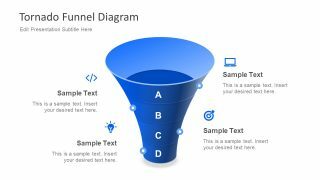 The marketing funnel template is a widely used business PowerPoint tool. Such as the customer journey presentation of a potential buyer to the sale, loyalty, and advocacy.